Install Your Open Source Apps With One Click! Did you know that today there are nearly 86 million active domain names on the Internet? That number only accounts for .com domains! With more TLDs, comes more opportunity! Our cPanel based Shared Web Hosting plans are user friendly and poised for scalability. Each and every plan comes with 300+ apps ready for deployment. Our VPS environment gives you total control and isolation: install and deploy your own applications, one-click tools for your virtual server, gain access to the underlying Linux OS. OpenSourceHost delivers an amazing suite of features with each and every plan. Whether you join us for shared hosting or to develop the next great app, we have you covered! Let Open Source Software inspire you! Open Source Software is the backbone of a free, open, and secure internet. 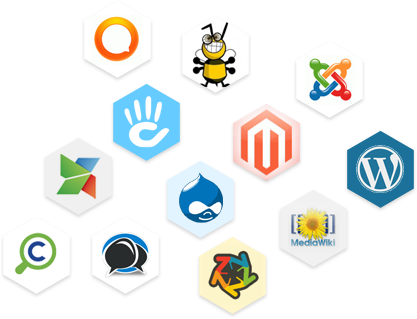 From basic forum applications to revolutionary content management systems, use any of the 300+ apps to inspire the world! Powerful systems require knowledge and expertise. With laser-like focus OpenSourceHost has dominated the Open Source Software space. Our customer-centric knowledgebase and top-notch support staff make possibilities a reality. If you're not a "dyed in wool" computer geek, these open source systems can be very intimidating. By partnering together with Softaculous we have taken away the guess work involved with deployment. Our systems will have you up and running in no time! Our reputation lies with you! In keeping with that philosophy, OpenSourceHost always strives to exceed customer expectations. Whether you have your blog, personal website, or large scale business application, OpenSourceHost always has your back! We offer 24/7/365 technical support through a combination of our phone based customer service team, online chats, email, and support ticketing system. When it comes to support, we take it seriously at OpenSourceHost.com; let us do what we do best so you don't have to worry!